A startling report was just presented at the 2009 American Heart Association’s Conference on Cardiovascular Disease Epidemiology and Prevention. The implications of that presentation will hopefully have a widespread impact on the future health of teenagers in the USA and worldwide. The report in question was based on a recent study published in the journal Pediatrics. The focus of the investigation was to determine the frequency and consequences of vitamin D deficiency in adolescents residing in the United States. Almost 3,000 boys and girls between the ages of 12 to 19 participated in the study. The group consisted of 49% females and 51% males. In terms of the ethnic breakdown, 65% of the group were classified as “non-Hispanic whites”, 14% were defined as “non-Hispanic blacks” and the remaining 11% were Mexican Americans. The researchers, based at Johns Hopkins Bloomberg School of Public Health in Baltimore, tested blood samples from the young men and women to determine their levels of vitamin D. The “biomarker” they tested for measures the vitamin D content that is derived from food, supplements and sun exposure. On average, the white volunteers had the highest serum levels of vitamin D (28 ng/mL). But the Mexican American and black participants had significantly lower levels – 21.5 ng/mL and 15.5 ng/mL, respectively. In particular, the black adolescents were generally considered deficient in vitamin D – given the current recommendations of at least 20 ng/nL. How can this discrepancy be explained? It could be due to higher amounts of melanin found in the skin of darker-complected individuals. Melanin is a pigment in the skin which helps to protect against ultraviolet radiation from the sun. This is usually a positive effect. But in parts of the world where sun-exposure isn’t plentiful, melanin may actually interfere with the skins ability to manufacture vitamin D. Other factors such as diet, obesity and limited access to the outdoors may also contribute to this health risk. Those with low D levels were 2.36 times more likely to suffer from hypertension (high blood pressure). That same group was more than 2.5 times more likely to have high blood sugar (a risk factor for diabetes). There was a nearly 4 times greater likelihood of “Metabolic Syndrome” among the vitamin D deficient boys and girls. Metabolic Syndrome (also known as Syndrome X) is a combination of conditions that raise the overall risk of heart disease and stroke. For instance, if someone has type 2 diabetes, high blood pressure and poor cholesterol figures, they’d be classified as suffering from Metabolic Syndrome. The lead author of the study, Dr. Jared P. Reis, observed that, “We showed strong associations between low levels of vitamin D and higher risk of high blood pressure, hyperglycemia and metabolic syndrome among adolescents, confirming the results of studies among adults”. The information presented at the American Heart Association conference isn’t the only alarm bell that’s rung recently with regard to vitamin D and our youth. Another 2009 trial, conducted on girls 12 to 14, showed a positive connection between adequate vitamin D and muscle strength. Consequently, those with lower levels of D exhibited weaker physical performance. Yet another study reported in the January 2009 issue of the Journal of Clinical Endocrinology & Metabolism showed increased body fat and decreased height as consequences of vitamin D deficiency. We’re often made aware of the importance of calcium during the growing stages of our lives. But I think modern science is telling us that we need to keep an eye on vitamin D as well. Not only does it play an integral role in the development of our skeletal system but its reach extends far beyond. We must also pay attention to the unique and different qualities that we all possess. In the case of vitamin D, the darker your complexion, the more at risk you may be for a deficiency. By increasing our awareness of the benefits and risks of various nutrients, we can help ensure the good health of this generation and those to come. Wow, I should get up earlier to get some sunshine. It’s already dark when I got up today. You don’t necessarily need to get sun exposure every day. Just try and get some on a regular basis. A happy medium may be best. That same doc told me I should strive for a level of at least 75. I read somewhere that blacks’ average level was 15. No wonder they have such poor health. I’ve tried advising them to take C3 but I think it in one ear and out the other. I think it’s a wise move, for everyone, to have their vitamin D levels tested. I believe that Dr. William Davis, a noted cardiologist, recommends D levels of 60 nmol/L and above. I take everyday a suplement of 1000 IU of vitamin D3. I avoid totally sun, the enemy of skin! If it’s possible, I would suggest getting a vitamin D blood test. It’s not always easy to know how well our body absorbs supplements. Since vitamin D is so important to good health, it may be worth the minimal expense (usually less then $50) to have your levels assessed. A higher dosage of D *may* be needed if you’re completely avoiding sun exposure. People living in harsh winter environments often require larger dosages to keep their D levels in a healthy range. Your lack of contact with sunlight may put you in a similar circumstance. I advise all menopausal women to get checked for Vitamin D levels. There is so much emphasis on mammograms and bone densitometry, but undiagnosed vitamin D deficieny has been linked to MS, breast cancer, and cardiovascular disease. The main disease process it can cause are osteomalacia (soft bones)which is just as bad as osteoporosis, it affects your strenth and stamina, fibromyalgia, and affects your teeth (more cavities), and now there is a lot research about a link of Vitamin D deficiency and depression. Thanks for sharing that, Mary! I’m very happy to know that you’re receiving top notch medical care! I had heard about vit D mushrooms but not until today did I find them in the grocery store. They are Monterey Mushrooms and are actually a little cheaper than the other packaged sliced brand. Sun treated mushrooms contain D2, not D3, so I won’t rely on them for my sole source of vitamin D.
Mary, I applaud your doc for checking your vit D blood level but I disagree that OTC vit D supplements are less effective to prescription vit D (D2). 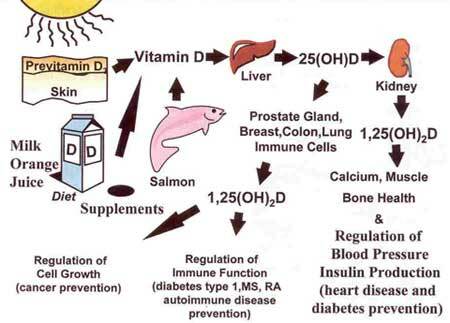 There’s almost universal agreement that OTC vitamin D3 is superior to prescription vitamin D2. I agree with you on both counts, Iggy. I’ve never tried that brand of mushrooms but we did recently have some delicious stuffed mushrooms. They were filled with fresh herbs and spicy Italian sausage. Delicious! Vitamin D-wise, it’s sunny about about 70 degrees around these parts. But I still supplement with plenty of D too. A randomized double-blind placebo-controlled study adding high dose vitamin D to analgesic regimens in patients with musculoskeletal pain. BACKGROUND: The current mode of therapy for many patients with musculoskeletal pain is unsatisfactory. PURPOSE: We aimed to assess the impact of adding 4000 IU of vitamin D on pain and serological parameters in patients with musculoskeletal pain. MATERIALS AND METHODS: This was a randomized, double-blinded and placebo-controlled study assessing the effect of 4000 IU of orally given vitamin D3 (cholecalciferol) (four gel capsules of 1000 IU, (SupHerb, Israel) vs. placebo on different parameters of pain. Eighty patients were enrolled and therapy was given for 3 months. Parameters were scored at three time points: prior to intervention, at week 6 and week 12. Visual analogue scale (VAS) scores of pain perception were recorded following 6 and 12 weeks. We also measured serum levels of leukotriene B4 (LTB4), interleukin 6 (IL-6), tumor necrosis factor alpha (TNFα) and prostaglandin E2 (PGE2) by ELISA. RESULTS: The group receiving vitamin D achieved a statistically significant larger decline of their VAS measurement throughout the study compared with the placebo group. The need for analgesic ‘rescue therapy’ was significantly lower among the vitamin D-treated group. TNFα levels decreased by 54.3% in the group treated with vitamin D and increased by 16.1% in the placebo group. PGE2 decreased by39.2% in the group treated with vitamin D and increased by 16% in the placebo group. LTB4 levels decreased in both groups by 24% (p < 0.05). CONCLUSION: Adding 4000 IU of vitamin D for patients with musculoskeletal pain may lead to a faster decline of consecutive VAS scores and to a decrease in the levels of inflammatory and pain-related cytokines. Int J Sport Nutr Exerc Metab. 2016 Apr 20. Compromised Vitamin D Status Negatively Affects Muscular Strength and Power of Collegiate Athletes. Increasing evidence indicates that compromised vitamin D status, as indicated by serum 25-hydroxyvitamin D (25-OH D), is associated with decreased muscle function. The purpose of this study was to determine the vitamin D status of collegiate athletes residing in the southern U.S. and its effects on muscular strength and anaerobic power. Collegiate athletes (n=103) from three separate NCAA athletic programs were recruited for the study. Anthropometrics, vitamin D and calcium intake, and sun exposure data were collected along with serum 25-OH D and physical performance measures (Vertical Jump Test, Shuttle Run Test, Triple Hop for Distance Test and the 1 Repetition Maximum Squat Test) to determine the influence of vitamin D status on muscular strength and anaerobic power. Approximately 68% of the study participants were vitamin D adequate (>75 nmol/L), whereas 23% were insufficient (75-50 nmol/L) and 9%, predominantly non-Caucasian athletes, were deficient (<50 nmol/L). Athletes who had lower vitamin D status had reduced performance scores (P<0.01) with odds ratios of 0.85 on the Vertical Jump Test, 0.82 on the Shuttle Run Test, 0.28 on the Triple Hop for Distance Test, and 0.23 on the 1 RM Squat Test. These findings demonstrate that even NCAA athletes living in the southern US are at risk for vitamin D insufficiency and deficiency and that maintaining adequate vitamin D status may be important for these athletes to optimize their muscular strength and power.